It is well known that marital arts schools use colored belts to denote rank. 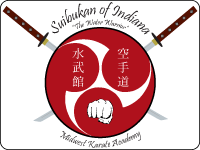 When a student enters Suibukan, the karateka (student) will wear a white belt. As technical skills are attained, the karateka will have the opportunity to test for the next highest belt. All students will progress at their own pace, and there is no question that daily practice, both at the dojo and at home, will rapidly improve skills. We use 7 belts for our youth, and 5 for our adults, as illustrated in the chart below. The top row is for mudansah (unranked) and the bottom row is for yudansha (ranked / black belts). Kata is the backbone of karate. Kata are predefined series of blocks and attacks that simulate combat with multiple opponents. As the student practices kata, the repetition will become instinctual. Through the diligent, committed practice of kata, the karateka's mind and body learn the system of defense and attack that make up karate. The dedicated student will teach the body to react to an attack with swiftness, accuracy, and confidence. Following are the kata requirements for each noted belt.